Welcome back to another week of Digital Digest! This week, along with our regular news and updates, we celebrate the return of a former reviewer who is rejoining us today with a review of Respond 2's mega-set, Tonight - 4 Decades of The Tonight Show with Johnny Carson! And it may not even be Halloween just yet, but we've got some Christmas DVD news for you as well! Let's get going! That isn't all for Warner Archive, though! Later in November, on November 30, they are releasing the animated spinoff of The Dukes of Hazzard, The Dukes! Details are a little murky on this release right now, but we assume that it will be a release of the entire series, consisting of 20 episodes. In other news, Shout! Factory has plans to release a few single disc releases of series that they've already released, including Adam-12 - Season Two, Volume One; Dragnet - Season Two, Volume One; and Spin City - Season One, Volume One. They will all be released on January 11 at a low MSRP of $7.93. Each of these will contain ten episodes, which, unless that episode count is incorrect, suggests that these will not be exact copies of discs from the previous releases. Finally, we go back to the department of current series on TV that we all knew were coming to DVD anyway, as Amazon.com puts up even more pre-order listings for the current seasons of various series on DVD. This week, NBC/Universal is in the spotlight, with pre-orders appearing for The Office - Season Seven (also on Blu-ray Disc), 30 Rock - Season Five, and Parenthood - Season Two! No release dates or other information is known just yet, but we'll have details when we get them, of course! There isn't much coming out on Tuesday (October 26) in the realm of sitcoms, but there are a few other releases of note, including the 15 disc set, Tonight - 4 Decades of The Tonight Show with Johnny Carson, which we have a review of today in Digital Digest. Additionally, we have C.S.I. : NY - The Complete Sixth Season on the way, and The Twilight Zone - Fan Favorites, which contains nineteen popular episodes of the series. Respond2 Entertainment has compiled a once-in-a-lifetime collection of the greatest moments in Tonight Show history in one 15-disc set - Tonight: 4 Decades From The Tonight Show Starring Johnny Carson. Perfect for the Johnny Carson or Classic Television fan on the holiday list, Tonight features over 50 shows hand-selected by the original Producer as the best episodes from the show's 30-year run, covering the 60's, 70's, 80's, and 90's! 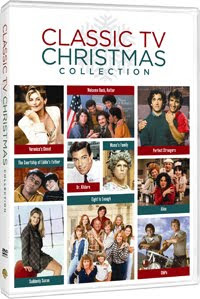 The collectable set features over 30 hours of material that has never before been released on DVD including rescued footage from shows originally airing in the 1960's (virtually all episodes and other content from the 1960's were lost) and all-new interviews with some of Carson's most celebrated and regular guest stars including Actress Loni Anderson, Comedian David Brenner, and fan-favorite animal handler Jim Fowler! Here is our review of Tonight: 4 Decades of the Tonight Show Starring Johnny Carson. Tonight: 4 Decades of the Tonight Show Starring Johnny Carson (Respond2 Entertainment, $119.99) features 56 episodes of the classic late night talk/variety show hosted by the late, great Johnny Carson for 30 years, in a beautiful 15-disc set. The episodes were hand-picked by one of the show's producers and are intended to give an overview of the best of the show's three decades on the air. This includes great comedy moments with Johnny with such memorable segments as "Tea Time Movie" and "The Great Carnac" and memorable guest appearances that really make up a "who's who" of Hollywood, including the likes of Burt Reynolds, The Muppets, Muhammed Ali, Robin Williams, David Letterman, and then-Governor Bill Clinton just to name a few. The set includes great moments, including Don Rickles continuously interrupting Frank Sinatra to throw insults, the TV debuts of greats like Jerry Seinfeld and Ellen DeGeneres, and great musical performances from everyone from the Jackson Five to Bette Midler to Luciano Pavarotti. Not to mention hilarious sketches from the Mighty Carson Art Players. I should explain, though, what this set is and what it is not. This set is not a "greatest moments" set. You will not find such things as Ed Ames throwing a tomahawk at a chalk drawing's crotch, the potato chip lady, or Johnny's last show. All of those can be found on other great DVD sets from Respond2/Carson Entertainment, and very little of those contents seem to be duplicated here. This set is a great sampling of the best shows from Johnny's 30 hears at the helm. These episodes give a great look back at what it would have been like to settle down at 11:30 p.m. to be entertained by Carson and crew. The packaging for this set is simply gorgeous. It comes in a sturdy cardboard box with a hinged lid, with the name of the set and a picture of Carson in later days with silver hair. The lid opens up to reveal four removable fold-outs that contain the discs and a booklet. Each fold-out is similar to the outside box, except the picture of Carson is from the same era as the episodes contained therein. The only complaint I have is that some of the discs overlap, meaning you have to take one out to get to another, but this can be overlooked. The booklet has a nice history of Carson and the show with some interesting photos, and a look at some of what you can expect from the set. The menus are very simple... perhaps too simple. You get the Tonight Show logo, a picture of Johnny, and a list that simply says "Episode 1," "Episode 2," etc. You have to refer to the booklet or the fold-out to determine which episode you want to select. There is a "Play All" button on each disc. After you select your episode, you're then taken to a generic slate giving the airdate and the guests, followed by a generic intro created for this set. The episodes themselves begin with Ed McMahon shouting "Heeeere's Johnny!" Video and audio quality seems to be good on this set for the most part, especially considering the age of these shows. The show tapes have been kept in a secret salt mine somewhere in the Midwest and the great care taken for them shows. There does seem to be some heavy compression issues with some shows, however. Some sequences seemed very pixilated on my TV screen. Audio is fine. Most of the episodes are in their proper mono sound. Stereo television was introduced in the mid-1980s, and all episodes from that point on are in their proper stereo sound. There unfortunately are no subtitles or closed captions. The special features are quite interesting. Carson and NBC did not begin maintaining a library of the shows until 1973, so most shows from before then have been lost to time. However, some great bits have managed to survive in clip form. The first special feature is called "Rescued Gems of the 1960s" and is just that. Nearly two hours worth of classic clips from 1960s episodes either thought long lost, or that only survived as clips. The clips are separated by chapter marks. Next is "Interviews: the Guests Remember" which is an interesting piece with frequent guests Loni Anderson, David Brenner, Jim Fowler, and Baxter Black reminiscing about their memories with Carson. I can recommend this set to pretty much any true Carson fan or to anyone who was either alive and wants to re-experience the Carson viewing experience or wants to see what it was like. The shows contained are highly enjoyable and give a great overview of Carson's three decades as host. On the other hand, I'm not sure I could recommend it to the extremely casual Carson fan who only wants a collection of Carson's most memorable moments. For that there are a number of other great DVDs out there at a less expensive price. Heeeeere's Johnny! Halloween weekend is less than seven days away, and we'll have few tricks and hopefully a lot of treats for you next weekend! We will have some Halloween themed reviews coming up, and, even though we have no "sweeps" standards to be held to, we have some special November sweeps style stunts coming up! Stay tuned and keep it digital!